Step into Salvatore’s kitchen where you’ll get a front row seat at the master chef as he boils and bakes his way to success. Spin the reels for a chance to earn some cash. All the while the chef stands by to make sure you stay entertained with his funny commentary. But be careful! You might get hungry! The Mamma Mia Slot – It’s Fantastico! 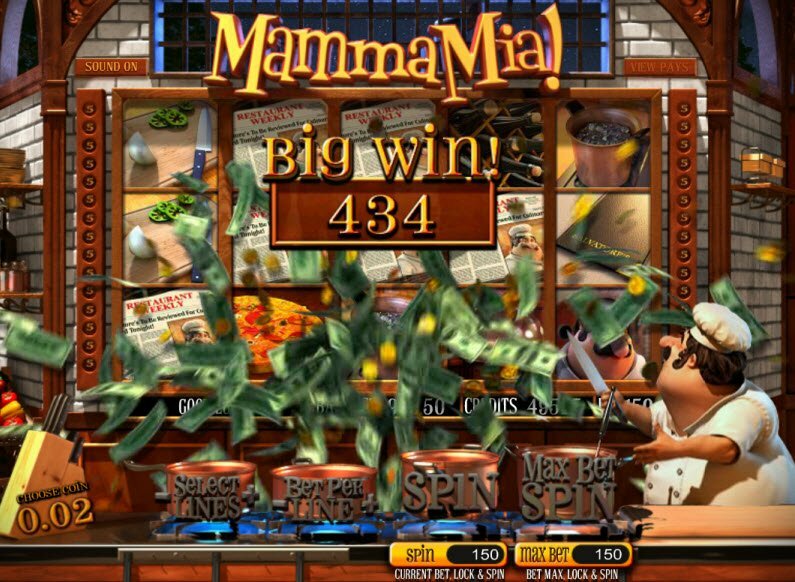 Brought to you by the Betsoft gaming platform, the Mamma Mia Slot brings a whole new flavor to the world of online casinos. Join the chef in his kitchen and see if you can help him impress the food critic. With luck you too will cash in on some lucrative prizes. 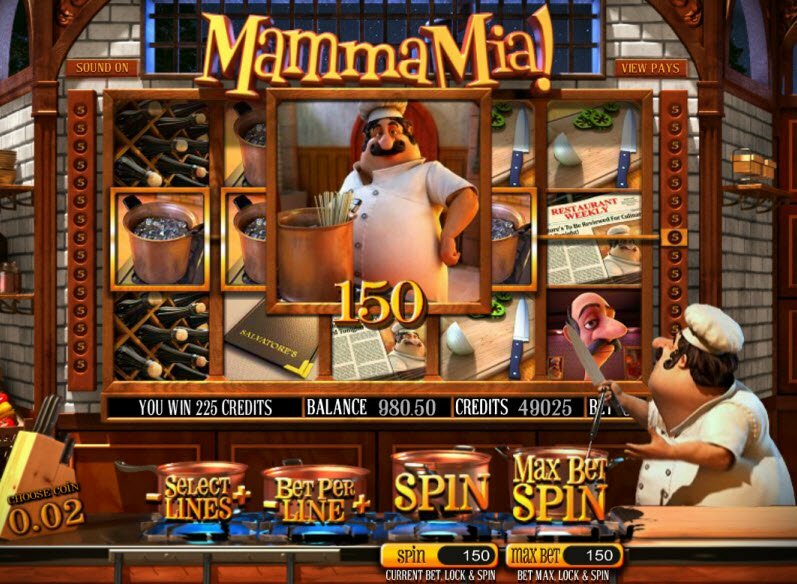 The Mamma Mia Slot contains all kinds of fun features such as Locking Wilds and a Bonus Game where you help the chef choose the right ingredients. With 30 total paylines, you’re sure to be hungry for more of this online slot machine! Right here and right now I want to profess my love for Betsoft Games! This software platform does a fantastic job at developing games with unique themes and high-quality 3D graphics. The Mamma Mia Slot Machine proves no exception. You’ll love the opening intro video with the Italian chef hard at work to create an edible masterpiece for the food critic. Spin the reels and the chubby chef cooks and comments in Italian throughout the game. Sometimes he even serenades with a little bit of Italian opera! As the reels land, notice the banging and clanking of pots and pans. Then during winning combinations, the reel icons come to life. The graphics are truly “fantastico” with crystal clear sound quality. You’ll be cooking up a storm with the chef, and tonight’s menu includes plenty of bonus features to go around. 3 or more pizzas on any reel in any position triggers The Pizza Free Spins Feature. During this amusing feature, you make a pizza with the chef! Get three of more of the menu symbols, and the game will trigger the Critic Bonus Round. During this Bonus Game, you must help the chef decide on the perfect dish to serve. You are then scored on 4 criteria by the chef. 3 or more of the food cover symbols activates the Food Cover Click Me Feature. Choose one of the clickable covers to reveal the credit prize hidden inside! 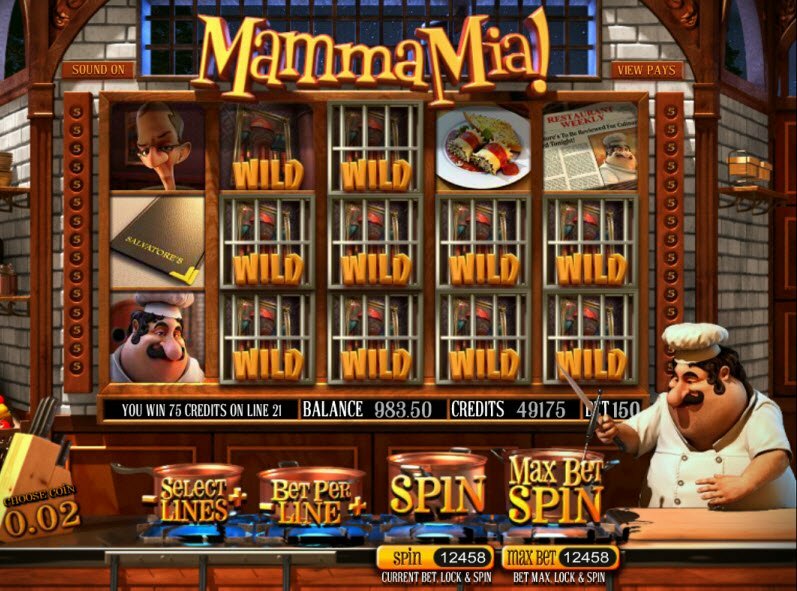 The Mamma Mia Slot Bonuses include Locking Wilds which lock in place each spin for an extra chance to win. The Wild Cards substitute for all icons except the pizza, click me, and bonus round triggers. They greatly increase your chances of landing on a winning combination.